At some point in your professional career, whether you are on the business or operational side of a media company, you will face a system changeover. It’s a tough process. Media organizations, like any business, change their business systems for many reasons. However, the fundamental reason really is to provide a framework for either reducing costs or enhancing revenues. Given that the cost of introducing a new system is itself quite significant, let’s explore revenue enhancement. In my experience, three broad transition phases exist. The degree of overlap and time spent in each phase is also a function of the above factors. Each phase is discussed separately along with its attributes, implications and suggested organizational actions. This is typically called “Fine Tuning”, “Shakedown”, “Bedding In” etc. It typically lasts for 2-4 weeks immediately after the live date. It may span across the live-date therefore last longer, depending upon the state of the old system, and if the client has desired a parallel run or pilot etc. This should really be considered as ”Taking Control of the Business” with the new system and it lasts for about 6-9 months after the system has settled down. This is a learning stage, one of the organization becoming ‘familiar’ with the new system and its operations. It can start during the regime of the old system but typically users will not accept the new workflow and operations until the comfort zone of the old system has disappeared. Develop products, rates, packages etc. The whole point of changing systems is to “Get Value from the System” you have just installed. This is an ongoing process, typically starting after about 6-9 months of operations. By this stage, the new system has become the ‘modus operandi’ of the organization and there is enough data to provide comparisons and historical perspectives. Users look for new ways to solve business problems and consult the system as a primary point of reference. It is critical that clients pass through Phase –1 Revenue Protection as quickly as possible. Being stuck in this phase will impact client confidence and hence their willingness to realize the promise of the newly implemented system. It is important to realize that these broad phases cannot be skipped. Whilst their distinction and characteristics will vary by site and business model, and transition from one phase to the next may not be concise, it is essential to recognize the actions required to make sure that the organization evolves to the last phase. Ultimately, the business controls the length of each phase. 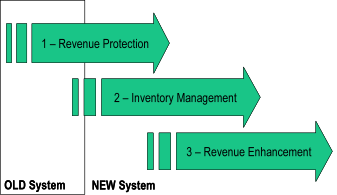 Some organizations never evolve into the final stage and may be quite content with ‘Inventory Control’. In all cases, it is the implementation team’s responsibility to recognize what is occurring and to evolve the organization’s operations to ensure the maximum return on investment. I just completed an innovation workshop for a management team in a large media company. One of the most important items in any innovative environment is communication and leadership at all levels. I thought these following leadership qualities were worthwhile sharing with you, for your day-to-day business activities. Persuasion making a strong, valid argument for your various stances and freely sharing your reasons is crucial in gaining respect for them, instead of just compliance. That also implies taking in and valuing the views of others. Patience don’t let your eagerness for achieving your goals translate into impatience at obstacles – whether human or process. Retaining a long-term view of your objectives will help enormously in keep small frustrations in perspective. Gentleness wins hands down over toughness, especially when handling the finer feelings of followers. Mentoring never assume, or appear to assume, that you know all of the answers. Always make it clear you are there to learn as well as to show how. Work to create a culture where diversity and different perspectives are valued above all else. Acceptance be slow to judge. Give people every chance to prove themselves and give them the benefit of any doubt. Kindness practice thoughtfulness in all of your dealings, especially with subordinates. Remember that the small details are often seen as the really important things. Openness be open to all ideas and true information about the people with who you deal. Consider their own wishes, values and aspirations rather than only their apparent behavior. Compassionate confrontation to create an environment where you can draw attention to mistakes and changes in direction without crushing people or discouraging risk-taking. Consistency your style of leadership should not be seen as something that you ‘bring out’ when challenged or to deal with crisis. If you strive for consistency, it will be a reflection of your principles and an expression of your character. Integrity let your words, true sentiments, thoughts and deeds line up with one another for all to see. Innovation is a way of life. It allows you to cope with change and to develop new strategies for personal growth. Those of you trend-watchers that have been following CES and the tech landscape will have undoubtedly encountered 2010 as year of the e-reader. Equally, many of you will no doubt have stumbled across the many rumors swirling around the January 26th date – widely believed to be the launch date of the currently non-existent Apple tablet, or what has been dubbed the iSlate. At CES we saw a wide range of electronic readers, from the palm sized Dell, to the Document sized Que, or the in between HP Slate as demoed by Steve Ballmer at the keynote. What I find most incredible about this, is that the rumors of the Apple Tablet have found substance in a diverse group of companies endorsing the ‘slate’ meme and investing R&D in delivering a tablet. Stumbling over themselves in order to beat Apple to the punch, assuming that Apple is indeed going to release a ‘slate’. Are we seeing a whole segment being born out of a previously failed vision and accelerated into existence by an Apple dream? I submit that, of all the major technology companies, Apple has earned the trust of consumers, investors and pundits alike. They are associated with disruptive innovation, and they are associated with game changing devices as exemplified by the iPod and iPhone. They were not the first MP3 player, and they were not the first smartphone, but they disrupted both segments. It is only reasonable to expect that a tablet launched by Apple will have the same, or similar, degree of success. Even if it doesn’t, Apple will be forgiven, as any attempt will still likely be better than the unimaginative devices already shown (and largely forgotten) at CES. If imitation be the most sincere form of flattery, then imitation of a mirage in advance of a possible product launch is indeed the greatest tribute the industry can pay to Apple. We are trusting this company to manifest our expectations and to surprise us. Therefore, Apple’s greatest asset is it’s trust. So, if we get an Apple tablet on the 26th, its success will be in no small part due to the low bar that has been set by Apple’s peers. Innovation and imagination is hard in itself – making it mainstream is extremely difficult. I hope Apple hits this out of the park – this is a form-factor that I’d appreciate, and I know that they’ll get the UI done right. BTW I am a proud owner of a still working, and oft used Newton MP2000 and I have forgiven Jobs for killing the Newton. Ideas on the Rise – Community, everything is connected, a corporate conscience, the worth of the wild, work as a spiritual journey. Ideas in Decline – Nation states, treating the world as a quarry, technology is neutral, growth is good, work as a commodity to be traded. The growth of genetics will lead to programs that enhance the physical and mental abilities of … the rich. It is predicted that some people alive today will still be alive in 400 years; that’s a lot of shopping. Breakthroughs in genetics mean we are starting to redesign our own species, blurring the ancient boundaries of our coming to life and the leaving of it. More and more of us could become composite beings – part biological, part mechanical, part electronic. We will adjust our own brains to boost IQ, filter pain and intensify pleasure. As a super-elite of cyborgs, some of us could end up ruling the world, or be rounded up and dismantled. The fastest growing branch of medicine is plastic surgery. digitized voice replication will convey a faultless reproduction of how we sound. It will shatter our sense of identity and further disrupt the meaning of “authentic”. Elvis sightings are a portent. The King will return to the charts with new material, appear on MTV and promote whisky. Our lusty fling with social media, crowdsourcing and the wisdom of the masses appears to be still ascendant. As for the decline, technology is far from neutral, it is still delivering magical gadgetry and work has become an even more outsourced and traded commodity, partly thanks to technology and communications. Reality is indeed becoming more virtual. So much so, that meeting someone for coffee, or calling them has been all but replaced with video-conferencing, Facebook, twitter and maybe soon ‘Wave’ing. Ad-dollars are following audiences online and chilling the spines of traditional, more tangible news sources. The noisy, slow, erratic, and wired dial-up internet has all but disappeared. Our Britannica, Compton’s, Funk & Wagnalls encyclopedias have been shelved for Wikipedia. CDs, DVDs (and probably soon Blue-rays) are being replaced by digital downloads, one title at a time. Phone land-lines are being unplugged along with the modem as family plans give household members their own mobility. Film and film cameras have all but disappeared as digital SLRs, pocket-sized digital cameras and even phones are capturing memories instantly and cheaply. Yellow Pages and address books are being recycled while technology ”lets your fingers do the walking” from the printed page to the keyboard. Printed store catalogs morph to the spam of the past, as they move from your mailbox to your inbox. Fax machines are now a feature on multi-function printers and who’s business card still sports a fax number? Cabling and wires fade from the edge of the network as wireless internet, wireless downloads, wireless charging, wireless headphones become the norm. Writing on paper has been replaced with e-messaging of all types – including this blog. Perhaps Richard saw something we have missed in this last decade?